Welcome to Jett's page on the Flymall. Jett's parents are both pilots, hence the name Jett. Jett will often accompany Harry as he travels around to different airports buying and selling aircraft. 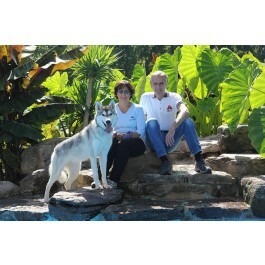 Jett came from BlustagTamaskan.com a breeder in North Carolina. The Tamaskan Dog is a crossbred dog of sleddog type, created in Finland, and as of 27 November 2013, has been recognized by the American Rare Breed Association, and the Kennel Club of the United States of America. It is a highly versatile dog that can excel in agility, obedience and working trials. It is also capable of pulling sleds, which is inherited from its Siberian Husky and Alaskan Malamute ancestors. Morphologically, Tamaskans have been bred to look like wolves and have a notable lupine appearance. Although there are a little over 400 registered Tamaskan Dogs worldwide, increasing interest has resulted in their spread throughout continental Europe, the UK and the USA, as well as Canada and Australia.